Something wicked this way came. 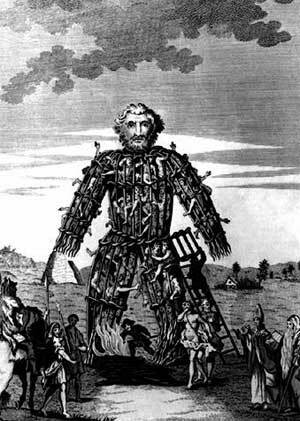 I posted last night about "Wicker Man Deaths," and minutes later, the above photograph was taken as the Dallas sniper shootings began. 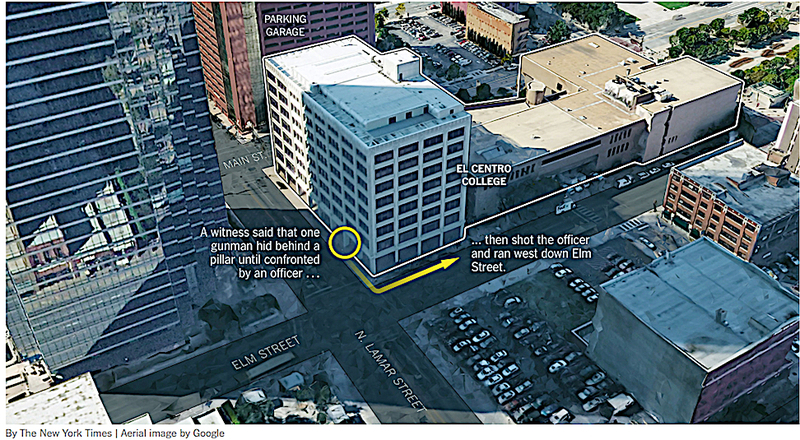 The individual who was in the 45 minute El Centro College garage standoff with police was reported to have said, "The End is coming." 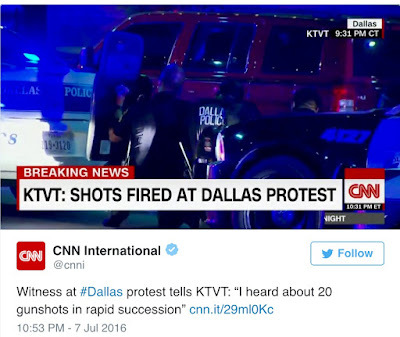 The "deadliest day" for law enforcement "since 9/11," says the media. The "worst day" in Dallas since the JFK sniper assassination (which "coincidentally" occurred in the Masonic site, Dealey Plaza down the street from this mass sniper attack). 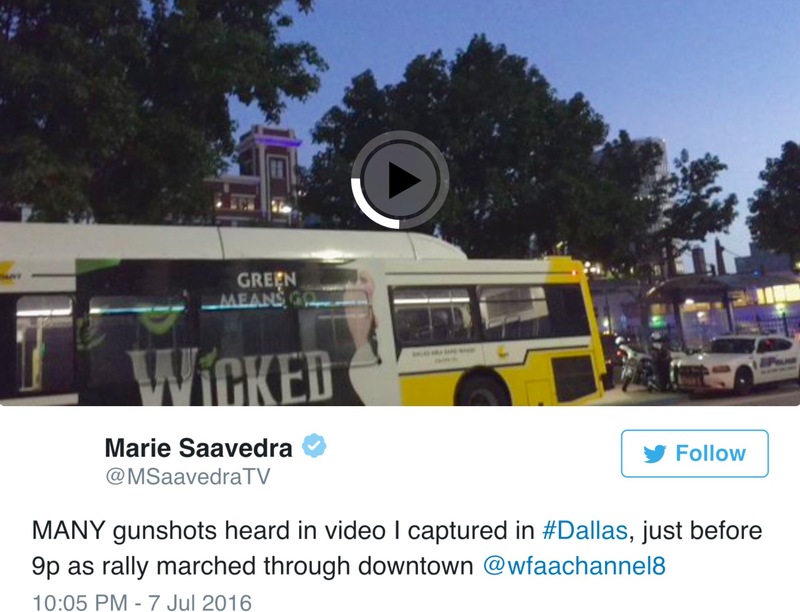 The police officers (DPD - Dallas Police Department - and DART - Dallas Area Rapid Transit) were protecting peaceful Black Lives protestors, when at the end of the protests, shots rang out. 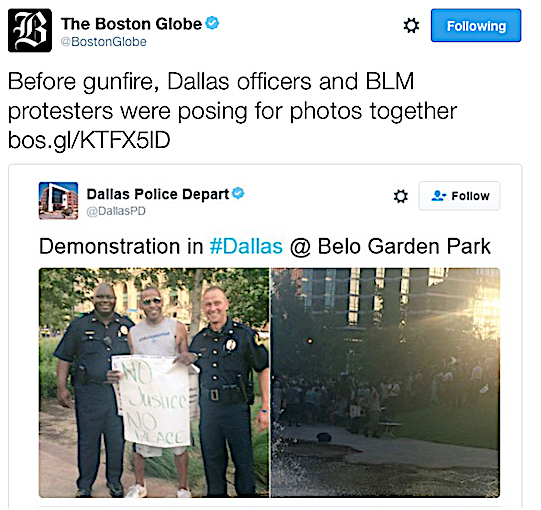 Reports broke at roughly 10pm ET tonight that shots were fired at a Black Lives Matter demonstration in Dallas, where people gathered to protest the recent police killings of Alton Sterling and Philando Castile. Multiple police officers and peaceful protesters were shot from "elevated positions," with series of controlled bursts, 6 shots at a time, audible on footage. 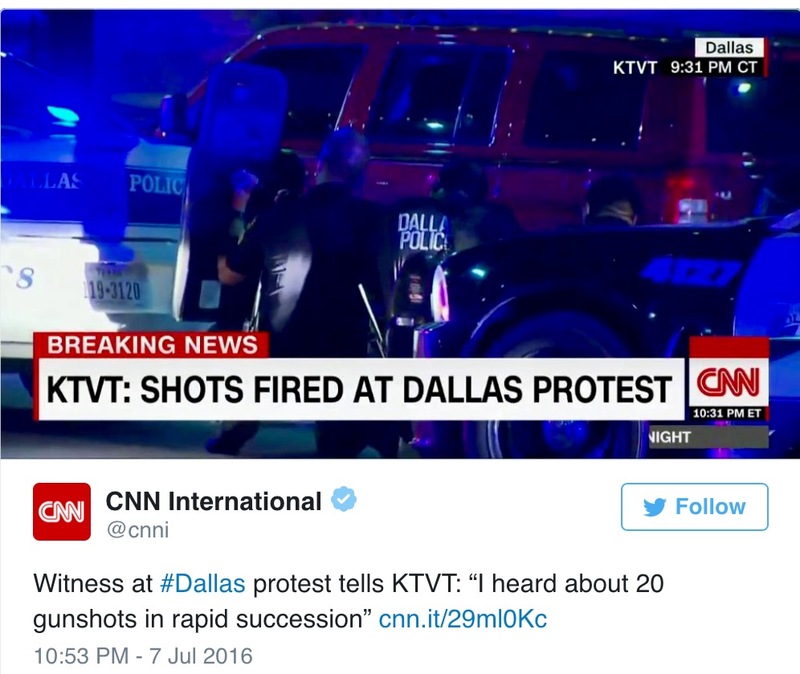 Dallas police report that 2 snipers opened fire and shot 11 officers. 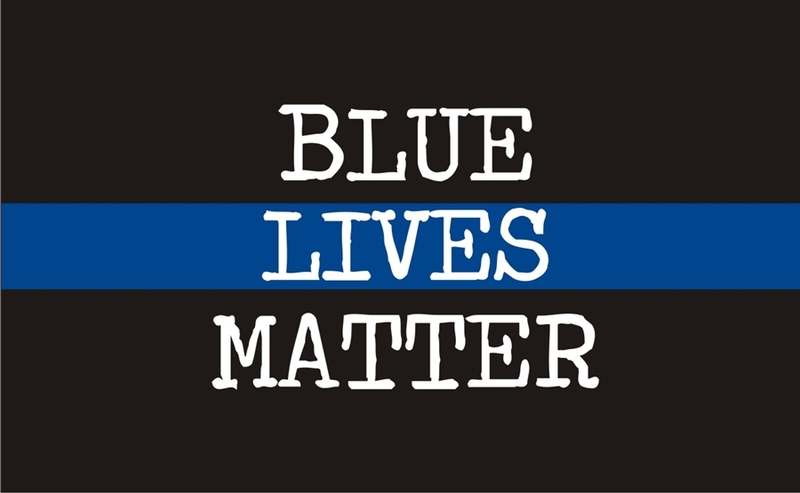 Four officers are reported to have died from their injuries. At least one person who was not a police officer is said to have been injured. The Dallas Police Chief says some of officers were shot in the back, and that the suspects "intended to injure and kill as many law officers as they could." Police say the suspects threatened to place a bomb in downtown Dallas. 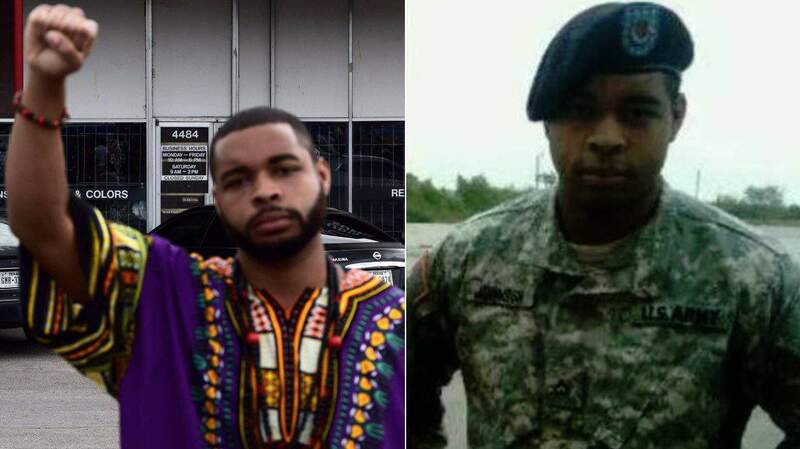 An Army veteran “upset about Black Lives Matter” and “recent police shootings” who opened fire Thursday night in Dallas in an attack on police officers has been identified as Micah Xavier Johnson, the Los Angeles Times and CBS News report. Micah Xavier Johnson, 25,...told police he was “not affiliated with any groups,” and he said he “did this alone,” the chief said. Don't forget the Trinity River. 33. It is noted in "King-Kill/33" that Dallas's Elm Street was historically known as "Bloody" Elm Street, as it "...was the scene of numerous gun fights, stabbings and other violence..."
Hi Red Dirt Grit, I was preparing to answer your comment on the Trinidad 33 posting site about the connection of the JFK assassination to the 33° latitudes that involve the bombing of Hiroshima and Nagasaki. 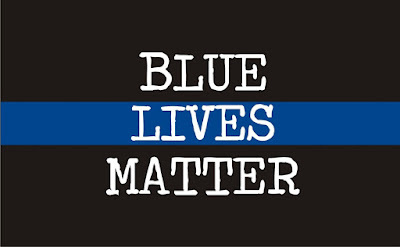 Now because of the police murders in Dallas, I am putting it here. 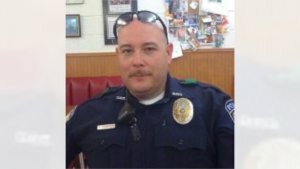 Please bear with the 33 analysis because the Dallas connection emerges at the end. Harry S. Truman, the 33rd president of the US and a 33rd degree Mason, after testing the plutonium implosion bomb “Fat Man” at the Trinity, NM site (latitude = +33.677302° = 33° 40' 38”) drops the Uranium bomb “Little Boy” on Hiroshima and 3 days later “Fat Man” on Nagasaki. Now the Dallas connection. Because the Trinidad, CO train-car accident took place between the freeway IH 25, called the John F. Kennedy Memorial Highway and the Purgatory River, then I looked up the coordinates of Dealey Plaza and noted an amazing coincidence. Difference = 0.00555° = 00° 00' 20” --- approximately 1/3 of a mile. Remarkable findings, Tom. That Dealey Plaza/Nagasaki link is shocking. Loren, could these events be a copycat of other summer-time race riots so prevalent in the 60' and 70's? It makes me think of Charles Manson's end-of-the-world racist scenario, he called "Helter Skelter". Which ties into the Beatles "Helter Skelter"
It's this line that jumps out at me; "I'm coming down fast but I'm miles above you." Helter Skelter: a British slang term for disorderly haste and confusion. Nov. 12 will be the 50th anniversary of the plastic-fantastic MI-counter-intell event, the psuedo "Riot on Sunset Strip". I keep noticing the shooter being referred to as "the lone gunman." I know it's a phrase used in other mass shootings, but in this case it has a certain eeriness.